Chagatai Khan: Operation Zarb-e-Azb: Now or Never. Way back in the 80s when the US CIA Chief William Casey passed away , the former Afghan War Veteran and Incharge of Afghan Desk Brigadier ® Yousuf (Author of Bear Trap and former Information Secretary of Farooq Laghari’s Millat Party) opined that loss of William Casey is a blow to Afghan Jihad. In any war indoctrination, books, pamphlet play a key role and during Afghan War the CIA-ISI Duo made effective use of Indoctrination , the backbone of Afghan Jihad were of those who followed Ikhwanul Muslimoon and their violent ideology and that ideology was tapped to get the desired results. “The CIA used Uzbek Exile to translate such material in Uzbek Language and also translated Quran in Uzbek language to push it into the then Central Asian States and that was in 1984. William Casey wanted USSR to bleed as much like the USA bled in Vietnam and after the breakup of USSR we witnessed the rise of Islamic Extremists in the Central Asia. Pakistan was a conduit for such indoctrination, and such indoctrination was excessively done with Afghan Refugees and Mujahideen as well , for example "quote" “Math teachers use bullets as props to teach lessons in subtraction. This isn't their idea. During decades of war, the classroom has been the best place to indoctrinate young people with their duty to fight. Government-sponsored textbooks in Afghanistan are filled with violence. For years, war was the only lesson that counted. 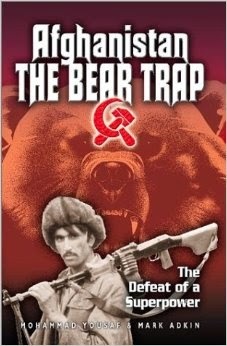 The Mujahideen, Afghanistan's freedom fighters, used the classroom to prepare children to fight the Soviet empire. The Russians are long gone but the textbooks are not. The Mujahideen had wanted to prepare the next generation of Afghans to fight the enemy, so pupils learned the proper clips for a Kalashnikov rifle, the weight of bombs needed to flatten a house, and how to calculate the speed of bullets. Even the girls learn it.” "un-quote"
Islamic Movement of Uzbekistan (IMU) was a semi criminal group using the name of Religion (earlier known as Adolat) to justify their existence because earlier they used to collect Extortion from Businessmen and Traders in Uzbekistan under the leadership of Juma Namangani (also served in USSR Army) with a firebrand Cleric Tahir Yuldashev, the organization was later banned in 1992 and Tahir Yuldashev & Jummah Khan Namangani both fled to Afghanistan where Jumma was killed in November 2001 after US Attack Afghanistan and Tahir joined the Warring resistance . 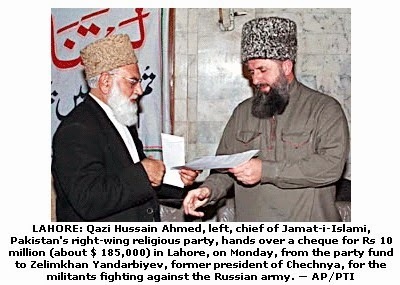 Glasnost and Perestroika encouraged these Islamic Uzbeks and their movement even more after the dismemberment of USSR and the hasty withdrawal of USA and others after USSR defeat provided the Jingoist elements within Pakistan Army to use such elements in Kashmir and against rival Factions of Afghan Warlords during the Afghan Civil War after USSR withdrawal , using the rhetoric of Global Jihad proselytized by the Preachers like Dr Israr Ahmed , after the USSR withdrawal the Pro Jihadists elements within the army allegedly used these Uzbeks as Shock Troops against Ahmed Shah Masood or to be precise Northern Alliance and at some point they became associated with Osama Bin Laden and other Middle Eastern Financiers with Takfiri bent of minds and by 1999 they became allies of the Taliban. Islam Karimov ruthlessly wiped them out after they attacked him and his regime in the 90s after 911 it is well recorded as to how the Former Taliban and other Militants poured in Pakistan and became a menace for Pakistan rather an existential threat. Yuldashev became sole in commander In late 2001/early 2002 the IMU moved into South Waziristan, the Federally Administered Tribal Areas (FATA) of Pakistan. They appeared to have broken apart during these years, but the organization regrouped and periodically clashed with Pakistan’s armed forces. These clashes, in turn, caused a reaction from the local tribes in Waziristan, who had taken the IMU in as guests and bore the brunt of counterattacks from Pakistan’s armed forces. 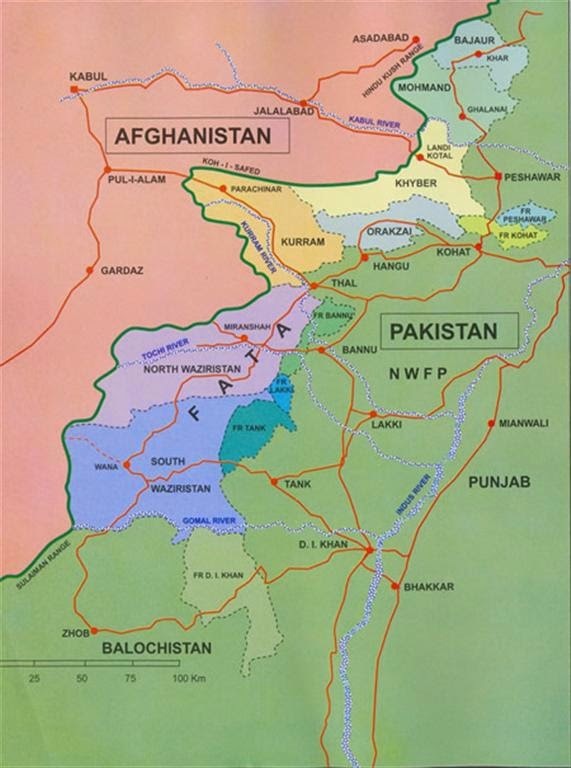 This may be kept in mind that many Central Asians and Arabs have married in the local Pashtun Tribes and borders between Afghanistan and Pakistan carry no meaning to them and we can also say that these Central Asian elements may have been used during Taliban War with Afghan Mujahideen Warlords and elsewhere e.g. Kashmir. Credible reports even suggest that even the Senior Leaders of Taliban, Al-Qaeda & other outfits were provided safe passage by the NATO/USA to conveniently settled in FATA, Pakistan with those tribes who were related with them by marriages. Uzbek are fierce fighters and fiercely loyal too they were in the inner sanctum of the Jihad Network of Al Qaeda and Osama Bin Laden and Ayman Al Zawahiri and also served as their personal bodyguards. In all this how these Outsiders became stakeholders in Pakistan and that is the question we should be aiming at , you see when Mullahs from Pulpit declare that Mulsims are one Ummah and Kufr is Millat-e-Wahida (means all Non-Muslims is one Nation) then its become tricky. State Functions (even a Muslim State) in a very practical way out of the box, rules (even the harshest Islamic States like Saudi Arabia and Iran do this) are relaxed to pursuit the National Interest but the trouble in Pakistan is that certain lobbies in Pakistan (both in the Civil and Military Establishment and even Political Parties) always use the word “Ummah” and this very word is a music for Islamists from all over the world who then justify to settle in cosy Pakistan and declare their Global Jihad from Pakistan without even bothering to pay attention that Pakistan is a signatory of UN Charter (GOOD OR BAD) and such declarations are considered Declaration of War but here comes another trouble i.e. TV Evangelist who are Pakistanis and are provided ample time on TV Channels and space in national dailies and harp similar tunes without even bothering about the ground realities of the world. The fact which is lost on Certain Belligerent Elements within Pakistani state is this that “Pakistan is a Nuclear State and repeated attacks on Strategic Assets by these Militants send wrong signals to the world” that Pakistan is an irresponsible state where the Religious Right can do whatever they like, e.g. defining Foreign Policy rather dictating it , often took out processions with the Models of Nuclear Bombs and Missile laced with Hate Placards and Banners against neighbuoring countries. This is not the end, these Militants are predominantly Sunnis with a Takfiri bent of mind particularly the Central Asians are hard-core Sunnis specifically the Uzbeks are historically rabidly Anti-Shia and in a diverse state like Pakistan such elements are recipe for the disaster when it is already riddled with Sectarian outfits at each others throats. 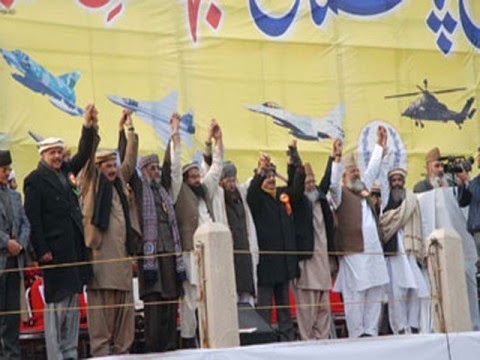 The IMU was evicted in 2007 from South Waziristan to other parts of the Federally Administered Tribal Areas (FATA) by Maulvi Nazir partly because Uzbek fighters offended local customs and acted like an “occupying” force in Pashtun territory . “quote” When the IMU joined Baitullah Mehsud’s faction of the Taliban, it had to accept Mehsud’s priorities, foremost of which was fighting the Pakistani state. It is a common knowledge that several mainstream parties and religious parties in Pakistan have their sympathies with these Jihadis and one doesn’t need the rocket science to calculate as to how the Uzbeks successfully operated and attacked Karachi Airport rather Pakistani Parliament was informed by its Federal Interior Minister in 2012 that Foreign Militants are in contact with Pakistani Militants and Banned Groups mostly concentrated in Punjab. After every Terrorist incident in Pakistan, the State shows it resolves on paper and in press statement that culprits would be tackled with Iron fist and Terror would be wiped-out and within a day or two the things become normal i.e. Ostrich State of Pakistan bury its head in the sand. The Rulers be it Civilians or Military are out of touch with reality , the Military is still stuck in Cold War Narratives and the Civilian Leadership cannot think beyond assembly proceedings, point of order and privileged motion and worse are the Urdu Language newspapers and TV Channels who cannot see what is about to hit them all. There are still people in Pakistan who support talks with the Militant after brazen Terrorist attack on Karachi Airport, no harm in engaging Militants in Dialogues but with whom and on what conditions and our leaders conveniently forget that these Militants have sympathizers in several Jihadi, sectarian, Religio political parties even in mainstream parties, and surrendering before these Militants means we are allowing them to extend their role in Pakistani Politics which (if happens) would be disastrous, they have already caused immense damage to the tranquility, peace & tolerance in Pakistani society. If anybody is interested in dialogue with these Militants then only on one condition “surrender arms, windup militia, accept Pakistani Constitution and that is it. Period. And Dialogue with whom? Dialogue with those who openly accept responsibility of carrying out attack on our Prime Intelligence Agency ISI and dialogue with those who don’t even hesitate to use innocent children as cannon fodder Dialogue with those who attack our Police Training centre Pakistan is not located on Mars, it is very much part of this world and nor we live in isolation and imagine those who from Pakistani Soil Threatens World Powers e.g. To Launch Attack on White House, USA and what we have here that daily after 1900 hours our TV Channels are stormed with Retired Army Officers and Ideologues carrying Anti India rhetoric without having the slightest knowledge about India strategic ties with Saudi Arabia & China who as per us are our Friends but one must do some research about India excellent diplomacy on both fronts . More embarrassing it becomes when some Nut Job appears on our TV channels and talk non-stop non-sense on such issues as if Foreign Office Spokesman. A Former Governor of NWFP now KPK even went to the extent of declaring TTP Militants and others in KPK as Indian Agents and conveniently forget the deal he himself signed with these Yahoos and even more embarrassing is the fact that these very Militants who later become pain in the neck for Pakistan were “conveniently declared “Soldier of Peace” and our mainstream parties particularly those who are allies of some religious parties and those who are sympathetic towards these Militants , conveniently forget that these Militant are basically predominantly Sunni with a heavy tilt towards Salafi Interpretation who consider other Interpretation as Innovation in Islam and their tolerance for Minorities can be calculated by reading their material on mainstream Muslims (those who differ with them) Pakistani Security apparatus lack the required finesse to tackle with these Militants with less collateral damage (and attack on Karachi Airport, Mehran Base and GHQ all are witnesses) , Government should have owned the Drone wholeheartedly & officially instead of double talk Until & unless Militants accept Pakistani State Writ and surrender before Law, there won’t be any success, these Militants will always be a threat to the State and Peaceful and Tolerant Pakistani Way of Life, the way it was before this Grand Afghan Mess and Jihadi Foreign Policy. Media both Electronic and Print is laced with poisonous content not only against Minorities but also against those who peacefully differ with these Extremists who are hell bent to start a Civil War in Pakistan. Pakistani Journalists and Anchorpersons, the so-called Defence Analysts and particularly the Mullahs they invite in their TV Shows leave no stone unturned to turn Pakistan into a big “Manazra Chowk”, the worst example is this that those Mullahs whose books are full of apostasy Fatwa against Rival Sects are often invited as a guests after every Sectarian killing to unite the so-called Pakistani Nation in the name of Islam whereas these Mullahs don’t even offer prayers behind each others. 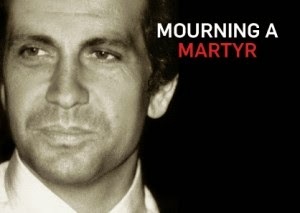 The worst moment for Pakistani Media was when a whole Media group created a situation which culminated in the brutal, calculated and planned murder of Former Punjab Governor Mr. Salman Taseer and later Pakistan’s Minority Minister Mr Shahbaz Bhatti , Pakistani Media (both Electronic and Print cannot absolve itself from these Brutal Murders. One of the leading Media Group through its TV Show incited people to murder the member of Ahmadi Community and no remorse at all. Difference of opinion with Quadiyanis, Ahmadis, Shias, Barelvis, Sunnis, Salafis and Deobandis is one thing but permission cannot be granted to attack each other lives, property and honour. The Pakistani State must intervene and put such Mullahs in order. Terrorist attack in Pakistan started after the Afghan Mess in 1979 and increased after War on Terror but we must not and cannot exclude Sectarian Attacks from Terrorism. Much has to do with State appeasement of these Mullahs who are used for the so-called Strategic Depths and become strategic curse for Pakistan but failure of our political class is also one of the reason, these political elites have completely dissociated themselves from lower middle class and have left the field open for Mullahs to encroach and do whatever they like. Finish them once and for all or be doomed. 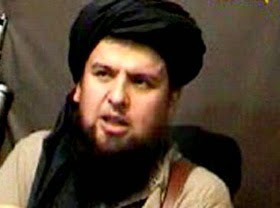 21 - Uzbek militant leader killed in drone attack By Bureau Report Oct 02, 2009 http://www.dawn.com/news/493937/uzbek-militant-leader-killed-in-drone-attack%20. 27 - The Indigenization of the Islamic Movement of Uzbekistan Publication: Terrorism Monitor Volume: 10 Issue: 2January 26, 2012 01:01 PM Age: 2 yrs By: Jacob Zenn.